The Grand Opening was a celebration of the collaboration among community artists, culture-bearers, the tribal council and the community. Over 800 visitors attended, including parents, children, artists, tribal dignitaries and longstanding ZYEP partners. 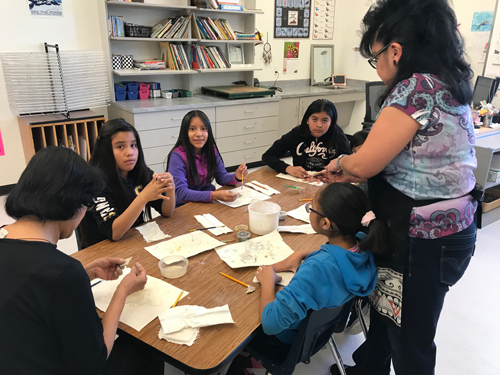 This second article of a three-part series tells the story of the Zuni Youth Enrichment Project, its mission and programs, and how it has fostered relationships and leveraged funding to grow from hosting one small camp to becoming an artistic landmark and a formal hub for the Zuni artist community. For the first 10 years, the Zuni Youth Enrichment Project (ZYEP) found success as a community resource for improved childhoods and heathy, active kids. Yet, for these 10 years, the project had to borrow space from a school site to host its programs. Those familiar with the New Mexican landscape know that just playing anywhere outdoors is not always an option. “There aren’t a lot of safe spaces,” says Joseph Claunch, Ph.D., co-director of the Zuni Enrichment Project. Indeed, Zuni Pueblo is remote and open spaces are covered with rocks and glass and “bull heads,” which Dr. Claunch explains is slang for the extremely sharp, spiky plants of the area. In 2016, this would all change. Through a rigorous application process, ZYEP was awarded a large and highly competitive grant through Art Place America, which would make it possible to plan, design and build a new youth center and community park. More than a safe place for children to play and interact, it would be specifically designed to reflect the identities and histories of the Zuni people. To do this, art would be incorporated at every stage, from design consultation with local artists, to the addition of artistic pieces throughout the physical park. ZYEP was one of only six organizations to receive the grants from Art Place, which is a 10-year collaboration among foundations, federal agencies and financial institutions whose mission is to position arts and culture as a core sector of community planning and development. In creating the park, the ZYEP Artists Committee was formed. Now the group continues to meet regularly on projects that transcend the park to serve a broader set of needs beyond physical activity. 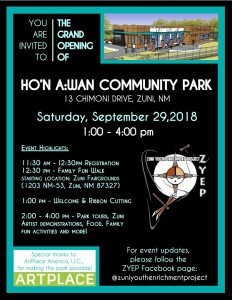 With funding established, ZYEP put plans in motion for Ho’n A:wan Park, which means “Belonging to All of Us” in Zuni. 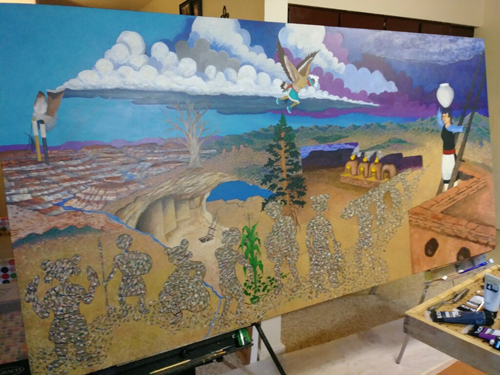 Knowing how the project would integrate Zuni art and culture, the organization immediately set out to connect with local artists. It formed an Artists Committee, who were called on to contribute artistic vision through every step of the process. 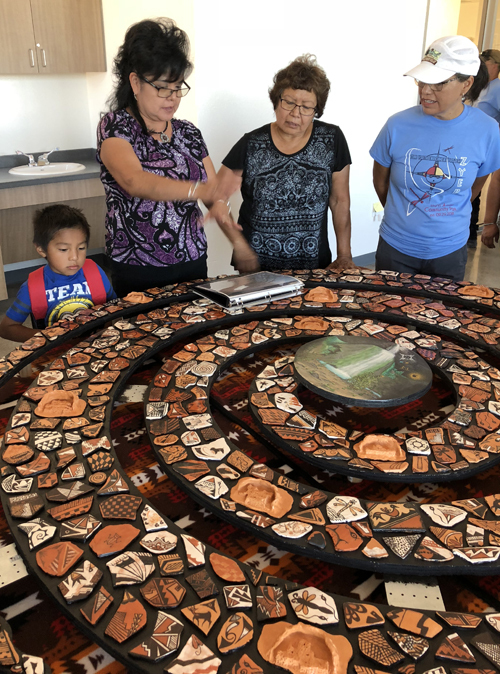 Besides lending their talents in a range of traditional art forms, the six-member Artists Committee also provided a connection to community stakeholders. 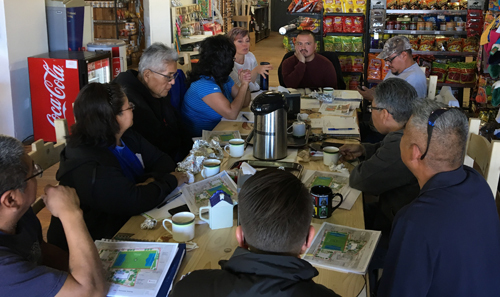 During the more than 30 community planning meetings, the artists communicated with members of seven stakeholder groups, including parents, elders, potential park neighbors, artists, cultural leaders, tribal council, and program administrators. They were able to alleviate fears surrounding how the proposed park would impact neighborhoods and traffic patterns, and whether the park would truly be a resource to all. The Ho’n A:wan Park was not only developed with the insights of artists, it also was designed to be a vehicle for art and culture. Here is one of the many murals featured in the community center and created collectively by members of the Artists Committee. Through it all, Dr. Claunch and fellow ZYEP co-director Tom Faber, MD, MPH, made it clear to the Artists Committee and to the whole community that ZYEP was founded on facilitating the connection of Zuni youth to their culture in everything the project does. As plans progressed, an official site for the park was found in the heart of the main plaza, which is the center of the Zuni Pueblo. In addition to the Artists Committee, ZYEP sought input from a Cultural Advisory Team, which ensured the site was not sacred and the park was built in accordance with Zuni culture. Because the site was close to religious areas, the Cultural Advisory team weighed in, making sure that the park architecture would not stand out and that it would blend with Zuni elements in color and design. Another feature of the murals is that they weren’t just done by master artists. The Artists Committee also reached out to children in local elementary schools and engaged them in designing and creating murals for the park. These projects gave Zuni youth participation in art for a park designed for them. 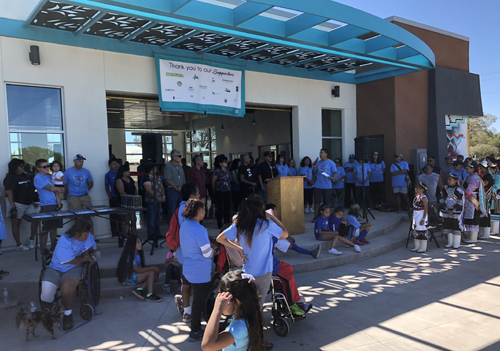 The community park officially opened in September 2018 as a 2.5-acre complex. It features an athletic turf field so children can run and play and not fall on rocks and glass. A community kitchen includes a traditional bread oven for preparing and learning to cook traditional foods. There is a community center, walking trail, community garden and basketball court. There are classrooms and office spaces and a large indoor/outdoor performance area for dances and events. Interior and exterior walls feature 11 large-scale murals created by Zuni artists. Going forward, Ho’n A:wan Park is still a canvas on which to do more. According to Dr. Claunch, there is a need for a perimeter fence, which in the spirit of Zuni cannot be chain-link. Artists are being called on to create that perimeter artistically, providing not only a functional wall but a gallery for the Zuni culture. Other projects include water collection designs and a statue. In this space, art will not sit on shelves but will be part of the environment, ensuring the culture lives on. Moreover, by involving and empowering local artists, ZYEP has created a new network of artistic professionals, who can see through an artist’s eye to provide the very best opportunities for Zuni youth. Part 3 of this series, along with a conclusion, will appear in the May/June 2019 issue of Indian Giver. You can see Part 1 at this link. A focal point of the community center is the showcase of pottery shards, each decorated with images and designs of Zuni culture. The table creates a display that visitors can walk around and experience. This entry was posted in NL01 by rblauvelt. Bookmark the permalink. Fantastic! I love that the youth were involved in the process too. Can you add share buttons to your articles for easy sharing on Twitter and Facebook?